The strong podium placing came after the Les Walkden Rallying prepared Production Rally Car class All-Wheel Drive WRX STI finished third on Heat Two, following yesterday’s third on Heat One. Mishaps for two other key championship contenders, Eli Evans and Steve Glenney, over the weekend, have now made the contest far tighter than many imagined before this weekend’s fifth round in SA. It keeps Subaru do strongly in the reckoning for a top three placing in the 2018 CAMS Australian Rally Championship, going into November’s sixth and final round, Rally Australia, in Coffs Harbour, NSW. A drama-free day for Molly Taylor and co-driver Malcolm Read saw the team place fourth across each of the five morning stages. 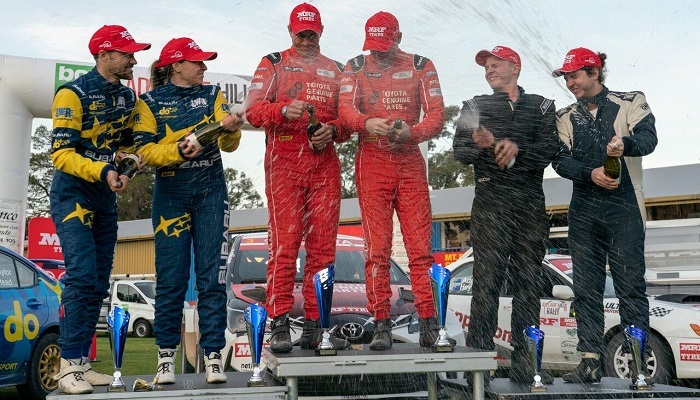 With initial third-place holder Glenney failing to finish this afternoon’s first stage, SS14, after rolling his WRX STI, Taylor and Read pounced once more, grabbing third on each of the final four stages to secure another hard-earned podium second to match their recent success in Tasmania. Championship leader Eli Evans, in the Skoda Fabia R5, was on a mission to make amends for an off on Heat One, that cost valuable position and points. Harry Bates, in the Toyota Yaris AP4, was focused on consolidating yesterday’s first place; while Glenney, lying second in the series going into this weekend, had been fighting hard to maintain pressure on Evans’ championship lead. Evans and Bates each achieved four stage wins – plus one tie, today. However, Evans’ 13th place on Heat One, combined with Glenney’s troubles today, make it a much closer championship contest, in the lead up to Rally Australia. The brutal nature of this weekend’s rally could be measure by attrition: just nine of the 16 ARC entrants completed Heat Two. While points will not be announced by CAMS until later tonight, Taylor declared herself pleased with the weekend overall – and the prospect of an intriguing contest in Coffs Harbour. She said: “Second in Tasmania and here has given us food for thought as to just how much we can achieve this year. “Certainly, the Rex is proving strong and reliable, so we’ve got every reason to remain focused and hopeful. The stop-start nature of some of the zig-zag forest stages this morning gave us a bit of a struggle at times, but we picked up pace again on the shire roads where our favourite sixth gear earned its keep. “The car’s had no issues again today, so both us and the Rex have been pretty consistent right across the weekend.